By 2024, we are connecting every person on Earth to the web with bandwidths far beyond what Fortune 500 CEOs and heads of nations had daily access to just a couple of decades back. This revolution will ignite a renaissance of innovation, and once again transform our planet. In the next 4 to 7 years, every person on Earth will gain access to the world’s information. What will these 4.2 billion new minds discover? What will they consume? What new companies will they build? What industries will they disrupt? We’ve already seen unprecedented acceleration of network growth and connectivity. But as the other half of our planet plugs into the web, this acceleration will only accelerate. So where are we going and how are we getting there? The jump from 3G to 4G brought you the revolutionary era of smartphones, mobile banking and e-commerce. But if you thought that was big, think again. 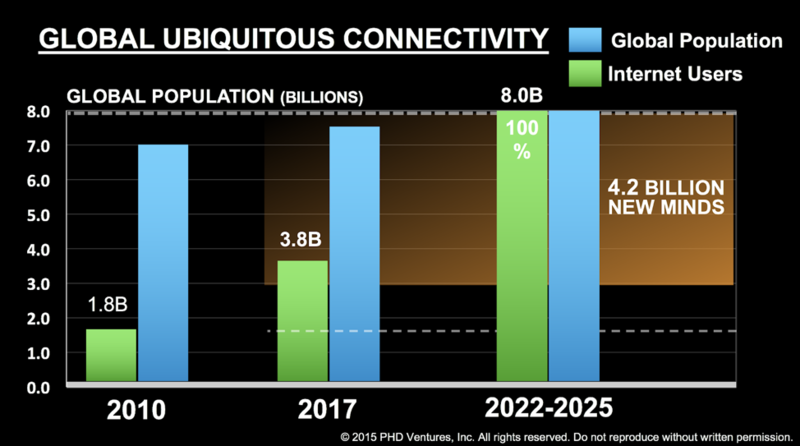 With plans for wide-scale deployment in 2020, 5G will be 100X faster than 4G, and 10X faster than your average broadband connection. To get a sense of what that actually means, imagine downloading a movie on your phone in a matter of seconds—or better yet, having your autonomous vehicle communicate with smart city sensors in real time. With 1 to 10 Gbps connection speeds, 5G is at the core of tomorrow’s trillion-sensor economy. Powering autonomous vehicles, smart factories (IIoT), remotely-controlled drones, VR and AR, in-home IoT, and the world’s first smart cities, 5G is about to allow every person on the planet to tap into data from billions of sensors around the globe. It’s the promise of on-demand knowledge for anyone, anywhere, anytime. 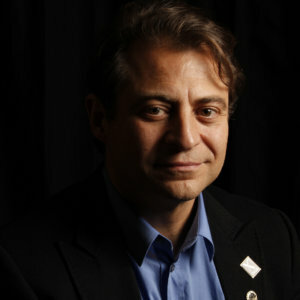 Imagine the extraordinary possibilities that such a smart world could unlock. No question about your environment is unanswerable, and answers are less than a split second away. With companies like Qualcomm and Intel leading the charge, some estimates put 5G infrastructure spending at over $326 billion by 2025. And while major players are linking the world’s devices and sensors at gigabit connection speeds on the ground, others are working from the atmosphere. As Google places high-altitude balloons in the stratosphere, SpaceX is beginning to populate space with constellations of internet-transmitting satellites. With balloons and drones hovering about 20 to 50 kilometers off the ground, companies like Google are working to connect 4 billion people to the web at unprecedented speeds. Coming out of Google’s X—commonly known as the ‘Moonshot Factory’—Google Loon is building out balloons that can direct themselves up and down the stratosphere, creating an aerial wireless network with up to 4G LTE connection capacities. Project Loon has essentially redesigned the key components of a cell tower to be light and durable enough for a 15x12m balloon navigating 20 kilometers above the Earth’s surface. Powered by solar panels that charge their batteries, Loon’s balloons are guided using predictive models of wind patterns and decision-making algorithms. Depending on where coverage is needed, balloons are quickly navigated into the right wind stream for directed migration. Each with a coverage area of 5,000 square kilometers, balloons can be deployed in no time. Using custom-built Autolaunchers, Project Loon can now fill and launch a new balloon into its network every 30 minutes, per crane. And by August of last year, Google had shown data transmission between balloons over 100 kilometers apart (in the stratosphere) and back down to Earth with connection speeds of up to 10 Mbps, directly to LTE phones on the ground. Having successfully provided connectivity to over 100,000 Puerto Ricans after Hurricane Maria in 2017, Loon aims to put thousands of balloons in the stratosphere, giving us connectivity anywhere on the planet. But Alphabet isn’t alone. Travel out another several thousand kilometers, and companies from OneWeb to SpaceX are powering satellite networks in the thousands. Imagine a swarm of thousands of satellites, migrating across the horizon, delivering a constant stream of broadband to the most remote corners of the globe. Now imagine this as early as 2020. With OneWeb and SpaceX deploying satellite constellations in low Earth orbit, science fiction is only years away. Backed by billions in funding from Qualcomm, Richard Branson, and SoftBank, among other investors, OneWeb is working on a constellation of about 1,980 satellites in total. 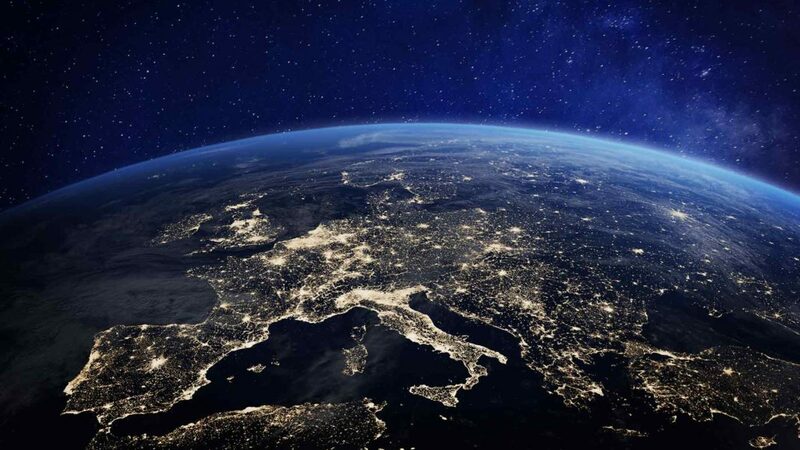 Aiming to be fully operational by the mid-2020s, OneWeb’s initial constellation is set to offer download speeds of up to 50 Mbps worldwide. In the meantime, OneWeb founder Greg Wyler has projected that customers will start receiving 500 Mbps of bandwidth in 2019 as OneWeb’s second generation satellites aim for 2.5 Gbps by 2021. And just this past June, the satellite broadband company received Federal Communications Commission (FCC) approval to serve US customers with a constellation of 720 satellites. But OneWeb isn’t stopping there. Using Amazon’s Blue Origin rockets to launch their satellites into space, OneWeb is gearing up for Round 2, recently requesting FCC approval of another 1,260 satellites, aiming for global, high-speed broadband. With targets of “connecting every unconnected school” by 2022, OneWeb hopes to entirely “bridge the digital divide” by 2027. And beyond OneWeb, we’ve already seen SpaceX launch numerous satellites into orbit aboard its Falcon 9 this year. Charging full speed ahead with its ambitious project Starlink, SpaceX has unveiled plans for a 4,425-satellite constellation in low Earth orbit to cover the globe with megabit and gigabit speeds. Finally granted a license from the FCC in March 2018 to operate an array of broadband internet satellites, SpaceX has been predicted to gain over 40 million subscribers for Starlink by 2025, translating to about $30 billion in revenue. But while revenue potential and connection speeds skyrocket, one primary challenge to satellite internet is latency. Even with strong broadband, it takes much more time for communications to travel to a satellite and back than via terrestrial connections. But as OneWeb and Starlink jump onto the scene, their low Earth orbit constellations are predicted to offer broadband speeds with unprecedentedly low latency. As of 2016, OneWeb’s constellation was designed to have just 30 milliseconds of latency—a remarkable leap for satellites. And with satellites placed closer to Earth, Starlink shows promise for much lower latency in the long-term. In addition to its initial 4,425 satellite constellation at about 1,150 kilometers above Earth, Starlink plans to place another 7,500+ satellites even closer at 340 kilometers in altitude. And with SpaceX’s intended proximity to Earth, latency delays would only continue to plummet, one day reaching comparability to current cable and fiber response times. But it doesn’t stop there. Zoom out another several thousand kilometers and you’ve reached O3b’s fleet. Working at an altitude about 8,000 kilometers above the Earth, O3b—or “Other 3 Billion”—has already built out an initial fleet of 16 satellites, including 4 new ones launched just this past spring. It’s already provided connectivity to multiple small island nations, but O3b is only getting started. Partnering with Boeing, O3b plans to launch an upgraded network in 2021, an ‘mPower network’ set to become the first ‘multi-terabit’ satellite constellation in space. Having contracted its first O3b mPower partner, Boeing Satellite Systems, SES’s constellation is planned to have 30,000 fully shapeable and steerable beams, which can be shifted in real time to align with consumers’ changing needs and connectivity demands. Offering coverage to almost 400 million square kilometers—four-fifths of the Earth’s surface —O3b mPower could become the most bandwidth-efficient system ever. Combined, these privately-run fleets could one day meet the internet traffic needs of entire countries, far-flung islands smattering the earth, and the most remote of peoples, now accessing a trillion-sensor economy on-demand, and at historic speeds. With 5G on the ground, balloons in the air, and private satellites blanketing the Earth from space, we are on the verge of connecting every person on the planet with gigabit connection speeds at de minimis cost. As 5G electrifies a world of trillions of sensors and devices, we’re about to live in a world where anyone anywhere can have access to the world’s knowledge, crowdfund ready capital across 8 billion potential investors, and 3D print on the cloud. And as the population of online users doubles, we’re about to witness perhaps the most historic acceleration of progress and technological innovation known to man.